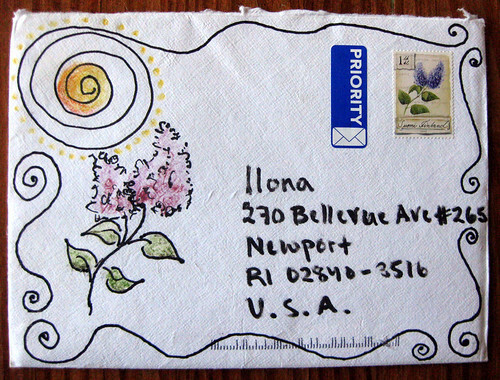 Here's proof that a Postcrossing card can turn into a pen pal! I got this artist's address for a Postcrossing postcard back in August, and she wrote me back the most beautiful letter, which she watercolored! Here on the envelope, she painted the same flower that she used on the stamp. What a lovely theme! Wow. So gorgeous. Watercolor stationery. I am verklempt. I like the little dots on the back of the envelope. 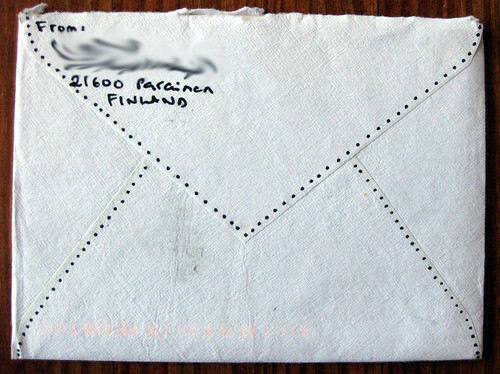 She blogged about this letter on her own blog, and in fact she was inspired by this here blog to start her own mail blog! 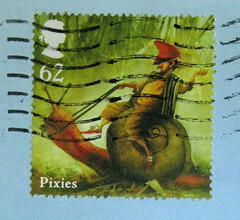 Her fine mail art blog is at sfimail.blogspot.com. Ilona I am envious. I have not seen such pretty letters since I was writing someone in the 1990s. You seem to get a large amount of letters and some of the prettiest as well! Do write me soon. 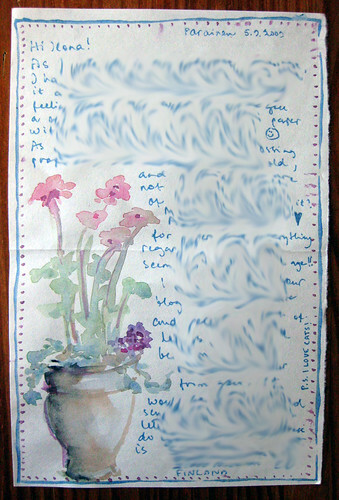 The watercolor is lovely, and I love the little dots on the back of the envelope - so cute! oh so am I . Im envious too . so cute . Thank you for posting this and the link to my blog! As I said, I will forever be thankful for getting the postcrossing card from you, because thereby I got to know you and the wonderful world of mail art! By the way, I noticed now that pictures look much better in your blog, when you are using photographing, than in my blog, when I'm using scanning. You're welcome, Sirpa! I'm so glad you've joined the world of mail art. My camera is not fancy - Canon Powershot SD 770. I find scanning makes colors look a little harsh or something, so I always photograph in natural light... and then I adjust the levels in Photoshop. I suspect it's the last step that makes the most difference. Hello, I'm new here, I mean I was a blogger long years ago and I decided to come back, I see now many people with blogs who likes penpalling. I must say I love to see the others ideas, I totally love the watercolors stationery! Yes, I see, and I don't really mean stupid, but I'm still wondering how this hasn't come to me to handle all the scanned pictures, when the handling of the photos is so important to me!